Overseas Highway, Florida Keys | Drive This One of a Kind Bridge! There’s nothing like a holiday in Florida and, what makes it even more worthwhile is a trip to the fabulous Keys. If you are near Naples, Fort Myers or anywhere on that side of the state, you will first need to travel to Miami or Fort Lauderdale before making your way to the Keys. 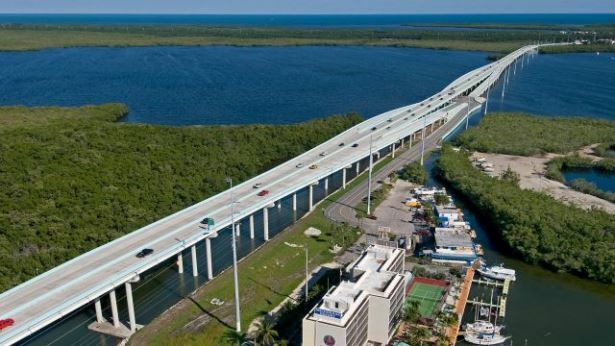 The Overseas Highway is 113 miles long and crosses the Florida Straights and the Gulf of Mexico using 43 bridges, including the Seven Mile Bridge. Originally built as a rail line in the early 1900’s. After being badly damaged by a hurricane in 1935, the route was converted to a road in 1942. The Overseas Highway was extensively upgraded in the 1980’s. The road is straight forward and you really can’t get lost. If you drive from Fort Lauderdale, you will pass Hollywood and then Miami. If you have set out really early, why not enjoy a beachfront breakfast before you continue? Once you are on your way again, you will pass the Montgomery Botanical Centre and Cinco De Mayo Park before you reach Manatee Bay. If you are traveling with children and they seem to need a run around, make sure you do so now because you will probably be anxious to slip into your swimsuit, hit the beach and enjoy some much needed rest and relaxation. Depending on your preferences, you can also stop at places like Lake Surprise, Garden Cove and other scenic points along the way. Nature conservation is also big in the Keys with facilities like the Crocodile Lake National Wildlife Refuge, the National Key Deer Refuge and many more. Once you reach Key West, you will fall in love with the festive atmosphere. Over St Patrick’s and other big celebrations, Key West is simply buzzing with life. There is music everywhere, the people are friendly and you may never want to leave! Interesting sights in Key West itself include Mile 0, the Southernmost Point of Continental USA and the U.S. Coast Guard Cutter Ingham Maritime Museum. Top activities are snorkeling, diving and anything water related. The road is very well managed and, although it did suffer damage many years ago, it has manage to stand strong against the weather and storm systems. It is a single-carriage most of the way but there are a few short 2 lane stretches for passing. The long straights make for fantastic visibility. Be wary of speeding though, as the local patrol cars are always on the look out for speedsters! Your final destination will likely be Key West where the streets are pretty narrow. If you book in at a hotel or B&B here, you might prefer parking your rental car and exploring on foot. You can rent scooters and bicycles here too if you prefer. Driving around Key West, however, will usually take longer especially during peak seasons. When planning your trip to Key West via the Overseas Highway, it is important that you book your accommodation in advance. Not only will it help you save money but, with such a booming tourism industry, you don’t want to be hunting for a room when you could rather be on the beach. Reserving your rental car and hotel stay together online can also help you save a fair amount on your travel expenses.